I want to bring to your attention, Asia’s biggest investing event – Value Investing Summit 2013. More information can be found at Value Investing Summit 2013 webpage. I’ve talked about this summit early this year in KL, and true enough, this summit is one to be at if you are interested in learning about value investing. 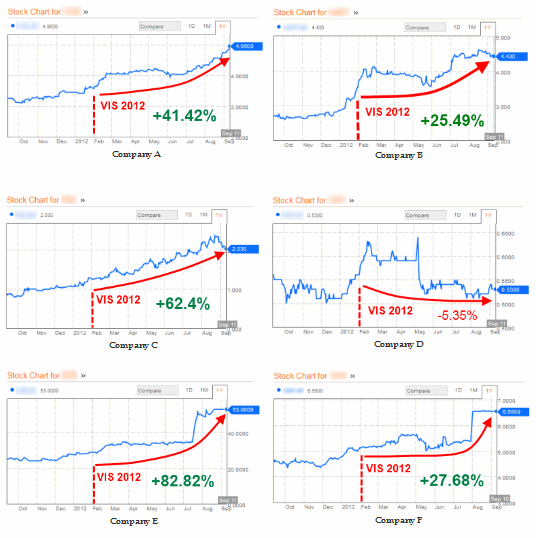 At last year’s summit, 6 Value stocks were being discussed at the event.. and true enough… 5 of the stock price shot up within the last 6 months – despite the flat, stagnation movement of the market. You may want to look at the proof in the graph below. For more info visit Value Investing Summit 2013 webpage. And yes… they will be sharing about their insights, strategies on how they pick out winning investments. Whats so different about this summit, if you’ve realized… is that most of the speakers ARE NOT trainers. They are real people running winning funds and making a living through investing. In other words, they don’t have a program to sell… thus… unlike other “gurus” event, where you get sales pitch after sales pitch… this is one event that promises to deliver top notched content throughout the 2 days. Oh by the way… like last year, you’ll discover more “value stocks” during the summit – An easy way to shortcut your research. Of course they may not be “buy” signals… but certainly a way for you to find out more about them after learning about them at the summit. So… if you want to gain distinction, network and progressively grow your wealth through 2013, I strongly recommend giving this Summit a look. I am a bit surprised you haven’t posted anything on ASB yet. Far as I know, the 2012 dividend announcement will be next Monday, 17 Dec.